TPC Overall Rank: #45 out of 2933 rides. User Tracker Count: 191 times. To date, Talon is easily the finest inverted roller coaster I have ridden. To me, this is the top dog at Dorney Park, and it flat out delivers on every single ride. Inverted coasters are a favorite of mine, and this one takes the best elements of that genre and molds them into this epic installation that should be viewed as one of B&M&#39;s greatest achievements in terms of the inverted coaster, which they pioneered back in &#39;93. The whole look of Talon is stunning, from the placement perched over the park entrance to the vibrant color scheme that glistens along its maze of steel. The waits are almost always minimal on Talon, thanks to a fantastic ride crew that keeps the 2 trains moving. The ride itself is pulse-pounding excitement, with a layout that is perfectly executed and never lets up! The first swooping drop is awesome and leads into a powerful vertical loop followed by a magnificent zero-g roll before diving down into a trench! Next up is a strong immelman loop, before the train then levels out and flies through a high helix-like turn. The mid-course brakes rarely touch the train, and the following drop is great, with even a hint of airtime. The finale, with its many ground-hugging elements, is taken at the same upbeat pace, and is the perfect closing act on this blockbuster coaster. Talon is a ton of fun to ride over and over, and it delivers a ride that is forceful, smooth, and thrilling! Talon is the second best invert Ive been on, only behind Carowinds Top Gun. The first drop was pretty funny as beneath riders were comments about the rides height. Anyway, the ride was pure insanity as it never lets up. The first drop was fast and had some really strong Gs and the following vertical loop was incredibly intense. After that was a great heartline spin that gave some decent hang-time and good Gs, followed by a great Immelman. Then came the fast paced finale that included a good air time hill, an intense corkscrew, and many fast turns. Well, well! B&M pulled off building this sweeet ride! And what a ride it is. Its very intense like the Batmans. It has such forceful inversions (unlike stupid Hydra nearby), especially its zero-g roll and loop. Another pro on the ride is that its rather hard to tell whats next for first timers, which makes the rides layout totally unpredictable. I love the way the creators of the ride made the ride quieter by filling the track with sand. I swear to god, when I was waiting in line for the attraction, I didnt hear B&Ms signature roar, but a much quieter one. Great job. And, of course, its glass smooth. 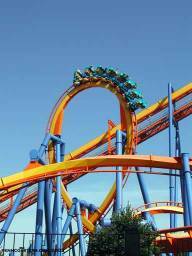 Just take a ride whenever youre in the park, its just one of the things that makes Dorney Park tick. Talon is definitely a great ride, my second favorite coaster at Dorney. 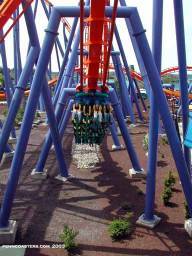 The ride begins in typical B&M Invert fashion, with a twisted drop followed by three consecutive large inversions. I didnt find anything too special about these, except for a very intense "pull out" of the vertical loop. The best parts of the ride are simple turns! This is where Talon is unique among B&M inverts and is the most intense part of the ride. Several of the turns are low to the ground, and I really felt blood sort of rushing to my feet as I was painless whisked through the elements. The corkscrew is probably the best of the inversions, taken low to the ground and at a nice speed. Unfortunately, there is a bit of a break in the action, right before the corkscrew, where the train seems to hover over a straight piece of track near the station at a very slow speed. I didnt get a ride in the front, but Im sure the visuals are great up there. Talon is not quite my favorite inverted coaster, but I really do appreciate B&M and Cedar Fair doing something unique that worked out very well. In the world of B&M Inverts, Talon is a champion among many. The inversions are smooth and plentiful. 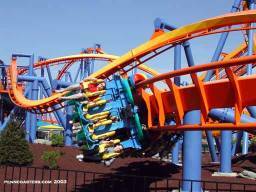 Ride it at night, Dorney Park doesnt put lights on Talon or Hydra at night. Also, one thing ive noticed is how efficient the staff at Dorney Park is. There are very few times you will have to wait in a significant line on any of the rides. Cedar Fair has their priorities straight. Cant wait to see what they did for the Paramount parks. Talon is now 10 years old, and it has gotten better with age it seems. 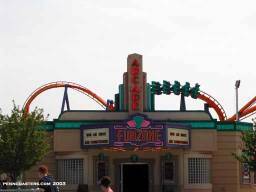 I first rode Talon back in 2007, and all 3 rides on that visit were different. I had one good ride, one amazing ride, and one just ok ride. Riding it again this year (2011), it was fast, intense, and tons of fun. This ride was also in the third row. Midcourse breaks were not applied, and it seemed to be running with full fury. The laterals and speed on Talon make for a much more intense ride for me, compared to Alpengiest and Great Bear, which are far more spread out and not as compact. Here's to 10 more years of an outstanding fixture at Dorney! My favorite ride at the park although I put more rides on Hydra. APPEARANCE-8 These are just so much better with a little theming or something to go with it. CAPACITY-8 Not as good as expected from a CF park. They seemed to be messing around. RIDE QUALITY-10 Nothing wrong here. Very smooth with good use of elements. FUN-8 The invert is finally starting to feel repetitive to me hence my lower rating then on others. Plus we were at a CF park so some fun is always removed. RERIDE-10 I would definately do it again on a non halloweekends trip to Dorney. OVERALL-44 AVG.8.8 I will go with the 9 here but just barely. This, out of all the B&M inverts I have ridden was my favorite. The drop is a good healthly 125-ish drop I believe. The loop hits the top at the perfect speed, offering just enough force. The Zero G Roll delivers just what it says it would with great air time. The Immelmann drops down into a trench would you arent really expecting, so you might pull your feet back and sends you back right from where you came. Then you head to a highly banked turn around at a decent speed, fly over the station, and go down into a quickly executed corkscrew and flung onto the break run. Over all it ties with Great Bear, they have the same inversions in roughly the same order, but the layouts are different and so is the surroundings, but both are as good as each other. A good inverted coaster. I like the drop and the parts when you are close to the ground. I still like raptor and montu better.